Amazing and unusually warm spring weather was the theme of our waterfall exploration on Saturday. Starting at Woman's Forum Overlook, the morning clouds and changing light to the east gave us an opportunity to check our camera settings and create some files to later check histograms and blinkies. We also tried a few shots with a graduated ND filter to even out the exposure. 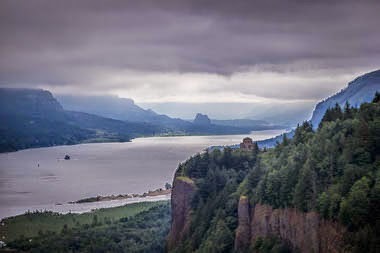 The sun was breaking through the clouds as we began our hike to lovely Wahclella Falls. It was also warming up quite a bit. There were not too many visitors, but the harsh light was challenging to get quality images, so we discussed various strategies with shutter speed and also use of depth of field. We also watched as the light and shadows changed dramatically on the falls. After lunch and a review session at Skamania Lodge, we headed to our second falls of the day, Elowah Falls. Strong light was still around, but it was fading as the end of the day approached. 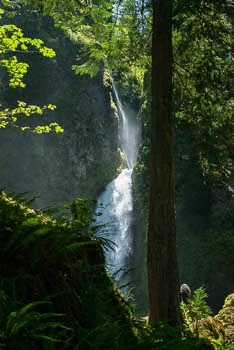 Elowah Falls is a high falls with lovely ribbon and curtain-like cascades of water. Various angles and formations were explored. There were also lovely ferns and reflected light in McCord Creek. 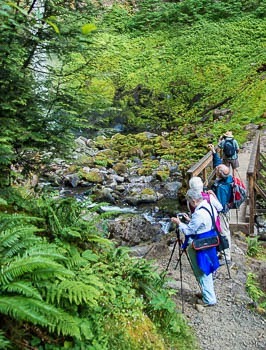 Gathering at the base of Elowah Falls. Thanks, John.